This product is a part of our new range! 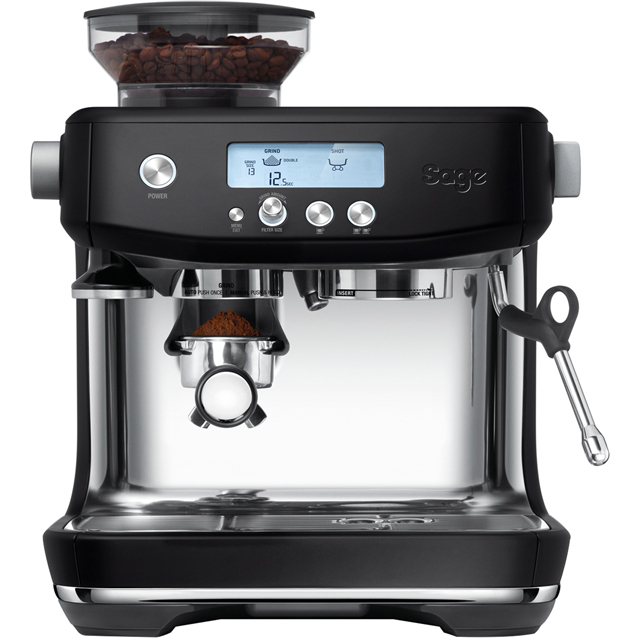 Enjoy fresh, barista-style coffee with this black truffle bean to cup coffee machine from Sage. Whether you prefer a smooth, indulgent drink or one with a little more kick, the variable grinding option lets you tailor the blend to suit your personal tastes. The built-in grinder uses less heat to preserve flavour, meaning every sip will be as delicious as the last. Plus, because innovative PID temperature control precisely heats the water during extraction, you’ll always get the best flavours and aromas. If you’re a fan of café-quality coffee, micro foam milk technology helps you get the hang of latte art. And, the useful auto clean function keeps your machine in its best condition, so you’ll get years of incredible performance. Whether you fancy a shot of espresso, a creamy latte or a rich Americano, the integrated conical burr grinder always gives the perfect coffee dose. Just select what you’d like from the drinks menu, and it’ll automatically grind the beans and dispense the ideal amount to suit your choice. This means you’ll get the best flavours in your coffee, for professional, café-quality results with every cup. You’ll never have to wait long for an indulgent coffee again, as this model has a fantastic ThermoJet heating system. Because it reaches the optimum temperature in just 3 seconds, you can start making your drink in no time. So, when you’re soldiering through the morning rush, or your guests are just keen for an after-dinner espresso, it won’t take you long to create that perfect coffee. With Digital Temperature Control (PID) and low pressure pre-infusion, you’ll always enjoy rich, aromatic espressos. Before brewing, the amount of pressure placed on the coffee grounds slowly increases, to extract all the flavours. And, by controlling the water temperature within 2 degrees throughout – keeping it precise and consistent – you’ll get every one of those flavours straight in your cup. So, your coffee will never be bitter or sour – it’ll be just right. With a sleek LCD display that’s so easy to read, you’ll have no trouble making sure you’re preparing the perfect coffee. Not only does it show exactly which settings you’ve chosen, but it also updates you on the progress of your drink. So, whether you’re in the mood for a creamy cappuccino or a stronger espresso shot, you can easily check that it’s being made just right. Whether you’re a seasoned barista or you’re new to the world of coffee, micro foam milk texturing helps you get hands-on to perfect your latte art. Using the powerful steam wand, simply froth your milk in the jug provided, and you’ll find it easy to create the ideal texture. Not only will this add extra flavour to a cappuccino, but it lets you get creative with designs on your coffee as well.